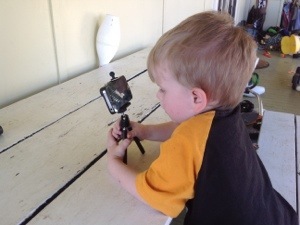 I took some time today to teach Lachie a bit of stop motion animation. He’s only 3, so I didn’t expect him to get far or have much patience, but he was a quick learner… After a short time he got the idea, how to move objects, how to keep your hands out of shot. We only made 2-3 seconds of film, but it’s a great start.